Look, a new planet was found... and it's convex! What do you people think of this new model of Earth? I don't believe Earth if flat or something like that, but their concept is interesting. In this model, Earth is not in the center of the universe (not geocentric), but it's a heliocentric model. The only difference is Earth and possibly other planets too. Imagine Earth as a flat half-pear. In this model Earth is also inclined, and this inclination is what gives the day and night cicle, while it spins like a disk, not a globe. The only thing I think they failed to represent in this convex version of Earth is the size of the Atlantic Ocean, because it's not that large! And the extra land is due to that Byrd almirant, that said he found land after Antarctica, an undiscovered and isolated continent. Water does not fall to space because Antarctica is a huge wall preventing that. And in this model gravity does not exist (maybe), things fall due to density of bodies. Gravity is replaced by density and magnetic energies. Very strange world, does it? Would you live in there, rsrsrsrsr? Why not Earth like a huge asteroid with atmosphere floating in space? Imagine that! Does space agencies hide something? NASA is the worst to me. And if there's really an undiscovered continent after Antarctica? Why no one do a transpolar flight across the interior of Antarctica? Why no one use a normal camera without that fisheye effect, a flat one, when sending balloons to space? To show for once all that Earth is a globe, not a flat disk or pear? OBS: I don't believe Mars is dull red. It's only red during global storms. While the sky is clear, the color varies from salmon to blue or green, depending on how the sky is clear from dust. Maybe the sky during winter is blue, and during summer is salmon, who knows? Those filters they use in rovers... And Mars spot from earth telescopes appear very different in color from those mosaics (Photoshop) they do. Yes, I believe there's something they know about Mars that they don't want to go public. Re: Look, a new planet was found... and it's convex! Probably would work well with Spell Jammers (AD&D series). As for Flat Earthers, they only take things in science that makes sense to them and then try to mold it to what they think (without even doing scientifically valid testing). There are 3 kinds of Flat Earthers. 1) The one who try to be scientists. 2) The ones who listen to them. 3) The ones who probably don't believe it but are making money off of them. As for the Mars, I don't see any issues. It will look different far away versus if you were on Mars. Things like airy disk and blur can alter or smooth out the colors. The asteroid is not big enough to it's own gravity turns it into a sphere, keeping one of the surfaces flat. And here it is, a flat world! I guess a ring world would technically be a flat but round as odd as that sounds. When you say "ring world", I start to remember me playing Halo, kkkkkkkkkkkk. That game, Halo, shows what would be in a ringed world, a very interesting concept. And yes, it would be somewhat flat. 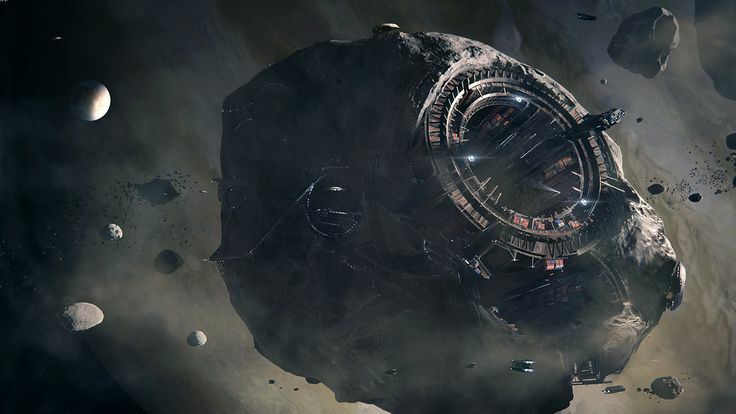 But the idea of a flat world built in an asteroid appear more... well... imagine turning an asteroid into a huge spaceship, with a flat surface and a huge dome! WOW! That is a neat picture. That almost sounds like what the movie Dark City did. How about a planet made of blueberries?